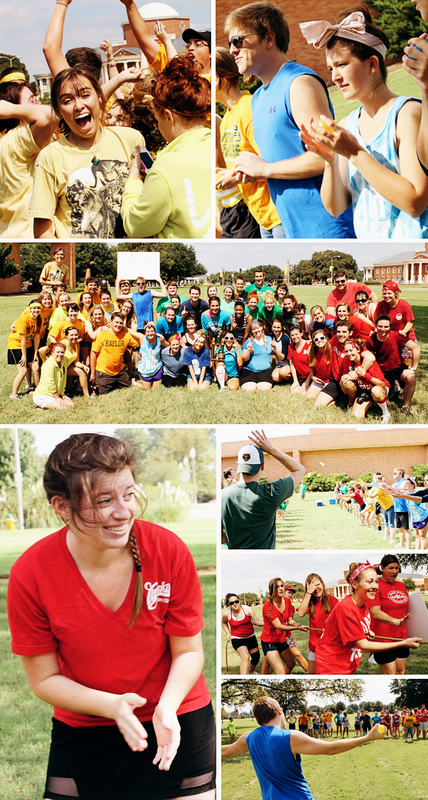 This weekend was the Second Annual BUT Olympics (BUT standing for BU Theatre of course)! The Druids --student society leadership team-- puts on this field day for the entire department at the start of the year as a fun and competitive community building event. The professors were our referees and the day was a complete blast! Last year was the first go around and we had a great time but our numbers were few. This year almost half the department showed up to participate! Woo! Each year is assigned a different color. The seniors are what?! RED HOT! Then the juniors were blue, sophomores yellow, and freshmen were in green. Last year's reigning champs, the class of 2014, won AGAIN and the seniors... well, we came in last place. But all in all it was such a fun time. The weather was beautiful Saturday morning, some of the nicest weather we've seen since school started. I would definitely call this weekend a success. I can't wait to hear about the BUT Olympics in 2013 even though by then I'll be long gone and graduated (crazy right?!). It was an AMAZING morning! And the high is only 93 this week! Hallelujah. I'm glad she's getting settled in and enjoying BU!